As I have argued elsewhere on this site, I think Nintendo is doing wild and crazy things with their new age of systems that, if a few things fall into place correctly, will allow Nintendo to become a serious player again in the coming console war. They have simplified controls to the point that they are no longer intimidating to non-gamers and created games that appeal to entire demographics that are not traditionally interested in gaming. Meteos is the perfect example of how this strategy can succeed. Blasting dirty hippy peace signs off of a planet is very rewarding. Meteos is a straightforward puzzle game. Using the stylus, you line up at least three blocks of the same color, which then “launch.” If there are a lot of Meteos (blocks) on top of those you have launched they will not go as far as if there were fewer Meteos on top. Launching Meteos off the screen fires them at the planet you are opposing. If meteos launch but do not make it off the screen they remain grey blocks that will move together for a few seconds after landing, giving you an attempt at lining up three blocks of the same color beneath any one of them. This allows for combos, with the coup de grace being “launching the screen” where, as you may expect, you launch every meteo off the screen. 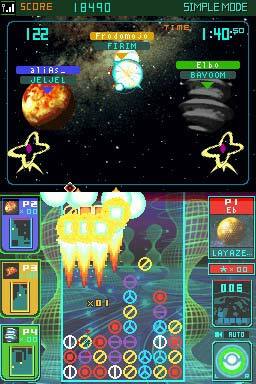 The game remains fresh in a number of ways, such as different game modes and, more importantly, the different gravities that prevail on each planet. Sometimes meteos will shoot off the screen easily, sometimes they require a foundation of grey blocks before launching. Sometimes they float back to the ground slowly, and sometimes vertical lines won’t fire at all. This variety of planets (which you can unlock over time) is wide enough that the differences are relevant, but not too wide where the gameplay experience would become unrecognizable. The different game modes are nothing really groundbreaking. There are the obvious ones, such as the “how much can you launch in X minutes mode” and “how quickly can you launch 100 meteos” mode. The only interesting wrinkle here is the Star Trip mode where, in addition to beating the level, you are required to perform some other feat, such as launching the screen or launching a certain number of green meteos. Completing the level without performing the task allows you to progress, but restricts your choice of paths, and ultimately prevents you from getting certain endings. Meteos has a plot, and a relatively deep one at that. This is fairly strange for a puzzle game. Tetris, the flagship for the genre, showed a few pixels worth of a rocketship launch if you managed to score high enough. The planet Meteo has apparently launched an attack on its neighbors, and the meteos invade. 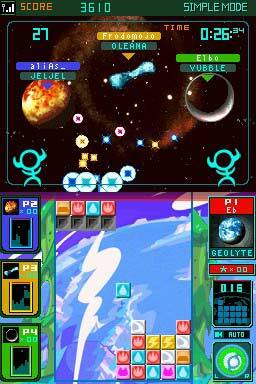 The planets band together to combat the meteo invasion by launching them off their homeland and at an aggressor. There are roughly a dozen endings, which are mostly a simple paragraph describing the actions of the planets and the fate of the galaxy. This never detracts from gameplay, but it is still quite odd. Those black blocks both help you and screw you. there are always three blocks of the same color somewhere, especially when the columns are high enough to threaten defeat (even in Tetris, it is frequently the case that you die after waiting quite a while for a single piece). This is satisfying and adds a cerebral aspect to the game. Unfortunately there is a flipside to this. Since there are always solutions, random scribbling will often yield fantastic results. This detracts from the satisfaction that comes from succeeding in the game, and is a cheap tactic in the (thin but entertaining) multiplayer option. I think the ultimate success for Nintendo, and for Meteos as a microcosm of the grand scheme, will be as a result of the accessibility of the controller, in this case the stylus. 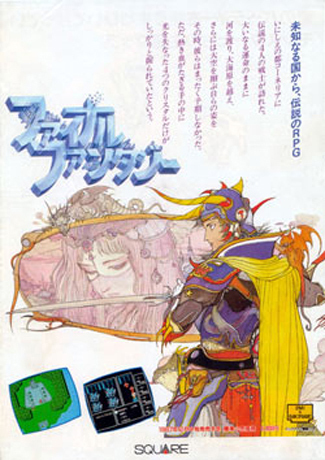 Anyone can pick up and play the game because it requires a simple visual interface rather than a complicated eight-button and two joystick controller (for example). Among certain types of gamers this may not fly, but for many others it’s just what the doctor ordered. Gamers jaded from playing the same game designs over and over should see this simple and excellent puzzle game as a breath of fresh air, and people who have never picked up a controller before can easily learn the basics of a game like Meteos. I have seen this with my own eyes. Sisters, female friends, cousins, all types of people who either have not played games in years or possibly ever are all willing to give Meteos a try, and some even become addicted (it was a huge hit at a BBQ a few weeks ago, to the point that people were asking if I could leave the DS behind when I left). Meteos meets all the qualifications of a great puzzle game — it is simple to pick up, but remains challenging to experienced players, it moves quickly enough that you oscillate between feeling frantic and feeling relieved, and, most importantly, it entices you into game after game with its “just one more” addictive gameplay.